The Archive. 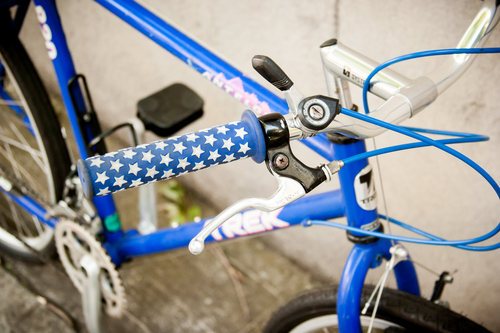 Selections from purchased used & custom built bicycles. 56cm Felt. Go fast road bike with 3x9 gearing. Trek 820. 20" steel frame, 26" wheels. Began life as a mountain bike, converted into an around town commuter bike with upright handlebars and road tires. Marin Larkspur. As new 2012 model. 19" hybrid frame. 700c wheels. Highlights include Shimano drivetrain, Linear pull V-brakes and puncture resistant tires. Soma Double Cross. 46cm. 2x8 Claris group. A custom build. Soma Double Cross Upright. 50cm. 1x7 Shimano. Mavic wheels. VO Milano bars. A custom build. We built this bike up from the frame, everything on the bike is new except for a few choice parts that fit just perfectly. This is the go anywhere, do anything bike for the rider who can't seem to find the right fit. Centurion Sport DLX. 63cm, complete Shimano 600 group. Raleigh Clubman. 55cm. Tiagra 9 speed goup. Swift Brooks saddle.